MERRY CHRISTMAS! What a joy it is to share with you what Jesus Christ—The Baby born on Christmas day—did through our project two weeks ago in Honduras! Born in that manger so long ago, HE is still changing lives today! Over the past several months the churches in Gracias, Honduras united together to pray over, and prepare for, an Area-wide Evangelistic Crusade. 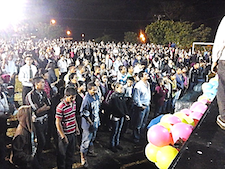 During the two nights of the Crusade (photo to the left), over 4,500 people (which is 12% of the regional population) attended to hear the Good News of Jesus Christ proclaimed through worship, testimonies, and the preaching of the Gospel! In tandem with the crusade, we proclaimed God’s Word in the local junior high and high schools. It was a glorious display of how God in the Flesh, born in Bethlehem over 2,000 years ago, is still powerfully impacting the world today! During this project we saw over 600 people make a public decision to repent from their sin and turn to Jesus Christ as their personal Lord and Savior! Our website www.scottnute.org has a video clip of this event for your viewing. There were numerous testimonies of lives that were touched by the Lord during this Crusade, such as the young woman in a wheelchair who, in spite of the rain, had her friend push her forward so she could make her commitment to Christ! One of the pastors involved in the outreach said, “The Crusade was backed by the Holy Spirit, and we received a great blessing hearing evangelist Scott preach the message of The Cross.” Please pray for the local churches as they continue the follow-up of those who trusted in Christ during the Crusade and School Programs. As you read this letter, I will be arriving in Buenos Aires, Argentina. What a blessing to spend a portion of the Christmas season serving with my brothers and sisters in reaching people in Argentina with the Gospel! December 5-7 we will conduct strategic evangelistic events with a “mother” church and their church plants. On the closing Sunday all the churches will meet together in a public movie theatre where I have the privilege to proclaim Jesus Christ. We will also conduct a Leadership Development Conference in connection to these single-church “crusades.” Please, join me in praying for many Argentinian moms, dads, single adults, youth and children to come to know the Savior of the world this Christmas season through these unique outreach events! We are already preparing for our projects next year in India, Bangladesh, Honduras, and other countries. Your generous end-of-the-year CHRISTMAS GIFT will help us to continue our ministry around the world! It is exciting to know we will be starting the New Year—2015—proclaiming new life in Christ to people who are not only seeking meaning to their lives for a new year, but are seeking meaning to all the years of their lives! THANK YOU for all the support and prayers you gave to our ministry this year! I am forever grateful to you!